It's time to clear some room on your shelves, here's the best new fiction books we think you'll want to read in 2017. There’s plenty to be excited about in the coming months with a whole host of brilliant new fiction books being published. 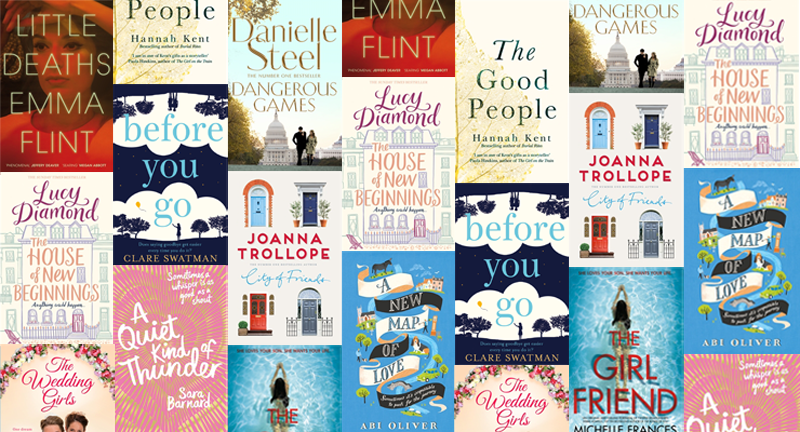 From the bestselling Joanna Trollope to debut author Emma Flint; and romance to psychological thrillers, there's something on our list of the best new releases of 2017 to keep every type of book lover happy. The fantastic, uplifting new novel from the bestselling author of The Secrets of Happiness and Summer at Shell Cottage, follows three women, Georgie, Charlotte and Rosa, who are thrown together as tenants of a house on Brighton’s seafront where they are all looking to make a new start. A novel all about fun, friendship and fresh starts. Available in Hardback and as an Ebook. Stacey, Beth, Melissa and Gaby had been best friends from the early days of university right through their working lives. But when Stacey's redundancy forces a betrayal to emerge that was supposed to remain secret, their long cherished friendships are pushed to their limits. TV correspondent Alix Phillips dodges bullets and breaks rules to bring the most important news to the world. But her latest assignment puts her at the centre of an explosive story that will reshape many lives, including her own: investigating damning allegations involving the vice president of the United States. A gripping story of corruption, ambition, power, and international intrigue. Out now in Hardback and as an Ebook. Steffi, a selective mute for most of her life has been silent for so long that she feels completely invisible. But Rhys, the deaf new boy at school, sees her. As they find ways to communicate, Steffi finds that she does have a voice, and that she's falling in love with the one person who makes her feel brave enough to use it. The stunning new novel from the bestselling author of Beautiful Broken Things. George Baxter has settled for a comfortable life, content as the years unfold predictably - until Win, his wife of twenty-six years, dies. But life has more revelations to offer him. Over the course of an English summer George uncovers some unexpected mysteries from his past, which could shape his tomorrows. Out now in Hardback, and as an Ebook and Audiobook. 1760, Spitalfields. Anna Butterfield’s life is about to change forever, as she moves from her idyllic Suffolk home to be introduced into London society. A chance encounter with a French silk weaver, Henri, draws her in to the volatile world of the city’s burgeoning silk trade. Inspired by real historical events and characters, The Silk Weaver is a captivating, unforgettable story of illicit romance in a time of enlightenment and social upheaval. County Kerry, Ireland, 1825. After the sudden death of her beloved husband Nóra finds herself alone and caring for her young grandson Micheál who is unable to speak and walk. As Nóra, Mary and healer Nance are drawn together in the hope of restoring Micheál, their world of folklore and belief, ritual and stories, tightens around them. Based on true events, The Good People is Burial Rites author Hannah Kent's startling new novel about absolute belief and devoted love. Out now in Paperback and available as an Ebook and Audiobook. Britain's magically skilled aristocracy compels all commoners to serve them for ten years - and now it's the Hadleys' turn. Abi Hadley is assigned to England's most ruthless noble family. Her brother Luke is enslaved in a brutal factory town, where new friends' ideals might cost him everything. A thrilling Orwellian vision of Britain, with a rebellious Hunger Games heart, Gilded Cage is the astonishing debut novel from Vic James. It's the summer of 1965, and the streets of Queens, New York shimmer in a heatwave. One July morning, Ruth Malone wakes to find a bedroom window wide open and her two young children missing. After a desperate search, the police make a horrifying discovery. Haunting, intoxicating and heart-poundingly suspenseful, Little Deaths is a gripping novel about love, morality and obsession, exploring the capacity for good and evil within us all. Out now in Paperback and as an Ebook and Audiobook. Seven years ago, Detective Paul Hoskins and his larger-than-life partner solved one of the biggest serial killer cases of the decade. Sammie Peterson was the lead reporter on the case. And the killer’s wife, Gloria, claimed to be as surprised as everyone else. Then a series of copycat killings take place, with the victims all connected. JoAnn Chaney's dark debut, What You Don't Know, tells the story of the three victims the murderer didn't kill but whose lives he ruined all the same. Out now in Hardback and as an Ebook and Audiobook. Laura has it all; a successful career, a long marriage to a rich husband, and a twenty-three year-old son, Daniel, who is kind, handsome, and talented. Then Daniel meets the young and beautiful Cherry. But she hasn't had the same opportunities as Daniel. And she wants Laura's life. The Girlfriend by Michelle Frances is a gripping and chilling debut psychological thriller, based on the fall-out following an unforgiveable lie. It looks at the potentially charged relationship between girlfriend, boyfriend and his mother and locates it in an extreme but believable setting. Out now in Paperback and as an Ebook and Audiobook. Emily Ryan has gone up in the world since her arrival in Sheffield. Married to Thomas Trippet - 'Trip' to his friends - their success is threatened by the Great Depression of the 1930s. Can Emily keep their family and friends safe from the shadow of unemployment? Following the gripping story of the Ryan family in Margaret Dickinson's top ten bestseller The Buffer Girls, Daughters of Courage sees Emily and Trip fight to keep their new life afloat in the turbulent 1930s. Evie spent her early years left outside on the step. With a drunk for a father and a neglectful mother, all little Evie has ever craved is a safe home and a normal existence. At sixteen she meets Ken, a sweet, brown-eyed boy, not much older than she is. Perhaps her fortunes have changed? But as soon as she gives over her heart she is betrayed, not for the first time in her young life. Will Evie ever find the love and warmth she's always craved? It's 1936 and the streets of London's East End are grimy and brutal, but in one corner of Bethnal Green it is forever Hollywood. Tomboy Stella and troubled Winnie work in Herbie Taylor’s photography studio on Green Street; their best friend and hopeless romantic Kitty is an apprentice dressmaker working tirelessly to create magical bridal gowns next door. Community is strong on Green Street, but can it stand the ultimate test? As clouds of war brew on the horizon, danger looms over the East End. Will the Wedding Girls find their happy ever afters, before it's too late? Out now in Paperback and as an Ebook.